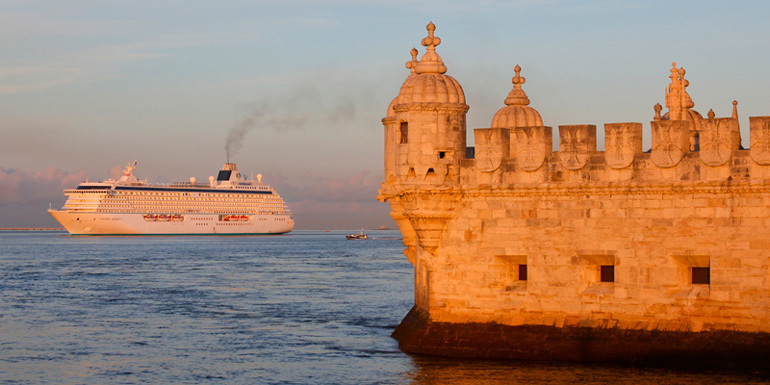 Itinerary: Six- to 12-night Mediterranean cruises; five- to 10-night East Coast cruises; 10- to 21-night Caribbean cruises. The ship embarks on a 108-night world cruise from Miami on January 14, 2015. Crystal’s service and its education-at-sea programs are deservedly renowned. This ship is best for culture-hungry cruisers. Those looking for lots of toys and kid-targeted entertainment at sea. Although there are activities for kids, passengers are mostly sophisticated, affluent types traveling as couples. The incredible final phase of a $52 million makeover is complete, resulting in airy, modern staterooms and ultra-luxurious penthouse suites. Food lovers will appreciate the reimagined “modern” cuisine in the dining room. Pick between — or mix and match — classic fare and exciting dishes based on molecular gastronomy. Penthouse suites come with lovely touches like daily canapé service before dinner, complimentary same-day pressing service, and complimentary self-service laundry facilities. Terrific lectures by academics on tour are broadcast via the ship’s television station. 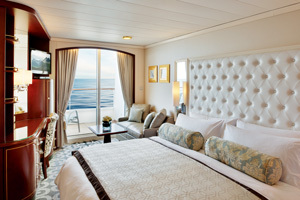 The 535-guestroom Crystal Serenity has been undergoing a dramatic, $52 million makeover as part of a $120 million fleet transformation since May 2011. Its final phase, a $17 million redesign of its now-airy Santa Barbara-inspired lido deck (think living walls, outside sofas, and a casual dining deck), as well as the ultra-luxe redesign of its penthouses, puts it squarely at the top end of the world’s best cruise ships. Other hallmarks of Crystal Cruises — its spot-on service and Creative Learning Institute® (including language classes, digital filmmaking courses, and knowledgeable professors who lecture along the way) — are as tremendous as ever. Itineraries are all-inclusive, with complimentary wine and spirits and prepaid gratuities, and there are little — but important — perks along the way, like attentive butlers on the penthouse decks. Crystal has always been known for the friendly formality of its dining room (yes, guests definitely do dress for dinner here) and the well-crafted offerings in its other venues, but along with the new design come a few other notable improvements. For several years, this traditional company has offered cruisers the option of its Perfect Choice Dining®, which allows guests to reserve times and tables in the dining room pre-cruise; we chose an early seating of 6 pm because we were traveling with our 5-year-old daughter. But some punchy new dining options inject fun without robbing the experience of luxury. The Lido Café buffet is as lavish as ever, with an array of options at every meal. Crispy-creamy French toast became our morning go-to, and made-to-order pastas, a terrific cheese selection, vast salad bar, and global-themed cuisines kept things interesting. Our favorite dining, particularly with a child in tow, was at Tastes on the lido deck: In the evening, the casual California vibe (it’s affiliated with Sapphire Laguna Restaurant in Laguna Beach) goes global. You can order as many tapa-sized dishes from the 15 on offer as you’d like, and they’re all winners. Our favorites were a creamy Alsatian tarte with bacon-leek jam and saffron-marinated lamb kabobs with mint-lemon yogurt. The only downside: The menu doesn’t change, so if you become addicted to Tastes, as we did, you’re limited to the same options each night. Also on the lido deck, Scoops ice cream bar serves up Ben & Jerry’s ice cream as well as frozen yogurt with tons of toppings, making it an afternoon must-visit. 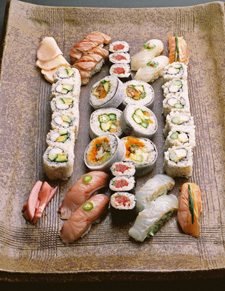 Our nightly routine was to go to one of the restaurants for appetizers and main courses, and forgo dessert. Then we’d head to the coffee bar for dessert bites, incredible cheeses, and a chocolate fountain. One of the best discoveries on the ship, it’s open from 9 am to 11 pm and is always good for a quiet getaway, even on sea days. There’s a technique to getting the reservations you want at the specialty dining rooms: Silk Road and Prego. You may make one reservation prior to sailing, but there’s also a rush on embarkation day to secure desirable reservations for special occasions. Try both. Prego, the charming Italian restaurant designed in partnership with Piero Selvaggio’s Valentino, serves perfectly executed Valentino classics, like his Black Angus beef carpaccio and an al dente, hand-rolled cannelloni dish with spinach and ricotta, which you’ll definitely want to try when sailing past Naples and Sorrento. We were eager to see how the Nobu-trained chefs at Silk Road stacked up to Nobu spots on land: We weren’t disappointed and ate at both the sushi bar and the tables. Mainstays like yellowtail sashimi with jalapeno and tuna tataki with ponzu sauce were executed just like at the land-based restaurants, and the chefs pulled out the stops with a crispy, soft-shell crab roll, as well as shrimp they’d just picked up in port and grilled. Crystal Serenity underwent a major renovation in May 2011, putting in new bedding and updated decor like tufted headboards and softer lighting; now all staterooms, penthouses, and suites have Blu-ray players and flat-panel TVs, plus electronic “do not disturb” systems so housekeeping will never have to knock. There are 13 room categories aboard Serenity (up from five and including “Pure” rooms for passengers with allergies); all have been made over to evoke old-school Hollywood glamour, plus they have 100-percent Egyptian cotton linens, Frette® robes, and Aveda® bath amenities. Even the smallest — deluxe staterooms with a large picture window — have a seating area and all the comforts, including in-suite satellite TV, movies available from the library, and complimentary minibar. Upgrade, though, and the rooms are an even better value. We stayed in a penthouse suite with a veranda, which, at 538 square feet, was large. The sizeable bedroom could be curtained off from the living room with its convertible sofa for our daughter; both rooms had flat-panel TVs with Blu-ray DVD/CD players that could be played at the same time without bothering either of us. The best part of the cabin was the bathroom, with side-by-side sinks, a separate shower, and a full bathtub with jets. But it was the perks that made the penthouse a deal: Aside from free same-day pressing and a self-serve, free laundry room, our butler brought predinner canapés every night. We could order in-room dining — even from Silk Road and Prego — and the fruit and minibar were replenished constantly. The penthouses are an impressive 1,345 square feet and come with a large private veranda, two walk-in closets, and even a private workout area. The space was reconfigured in the new design to add a shower to the second bathroom, so the den with a sleeper sofa can function as a second bedroom. replaces them with wicker love seats and plush pillows. Crystal is known for its themed cruises, like Pacific crossings that explore maritime history and cruises for golf aficionados that have you teeing off at renowned courses and classes taught by PGA pros. During the day, many passengers staked out their spots around the pool, with its ultra-comfortable lounge chairs and shaded couches, but the thoughtfully curated library (books in multiple languages, plus DVDs) was also put to good use, as was the Hollywood Theatre, which played new releases. The TaylorMade golf clinic with a PGA teaching pro was in full swing (ahem) most days, plus there were good yoga and Pilates classes. The quietest place we found was at Crystal Spa. After watching our departure from Venice through the floor-to-ceiling windows from an elliptical machine in the fitness center, we drank tea in the relaxation room — completely alone. 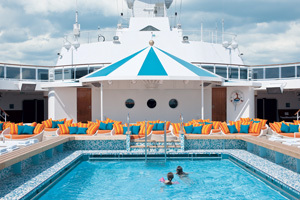 Unlike some other spas at sea, the one aboard Crystal Serenity was a serene (read: no product hard sells) experience. When we booked (get there early; it fills up fast), the therapist suggested an evening appointment for our treatment. This was truly the most luxurious part of the trip, getting a massage next to a floor-to-ceiling window as darkness set in. At night, the ship strikes a perfect balance: There are enough options that everyone has something fun to do but not so many that it feels chaotic. The Crystal cast came together for a well-produced medley of Broadway show tunes, for instance, and when the ship docked in Kotor, Montenegro, a traditional music and dancing show came aboard. Our favorite evenings were spent on Deck 5, midship, where those taking an after-dinner drink in the Crystal Cove bar could watch performances by a talented pianist or strings group. Dancing with the Galaxy Orchestra began later and, because Crystal Cove is open to the floor above, you can take in the action from The Bistro over dessert. With our selection of delightful pastries and cheeses, listening to “The Moldau” by Smetana, well, we could even feel civilized with a 5-year-old. What do you like best about Crystal?